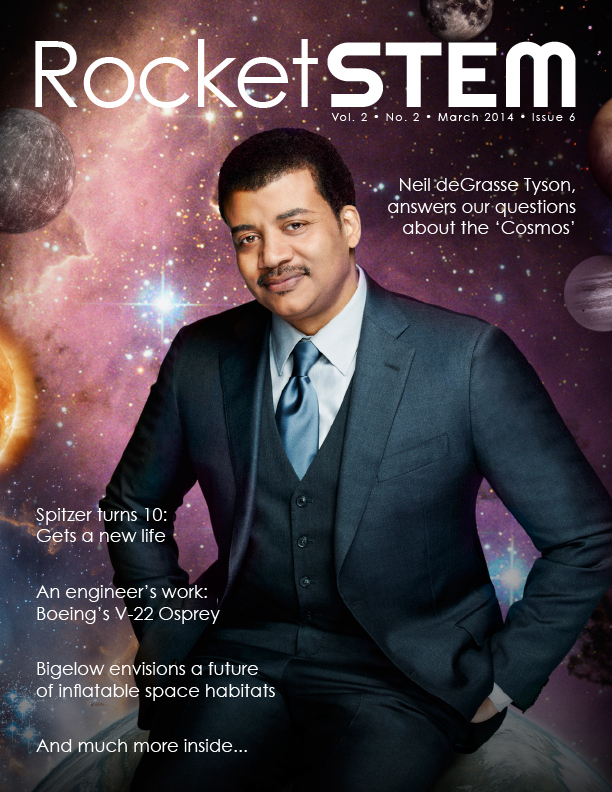 Staring at the stars is the theme of the March issue of RocketSTEM. Both above us in the sky, and in Hollywood, as we take you inside the production of the new “Cosmos: A Spacetime Odyssey.” Our coverage of “Cosmos: A Spacetime Odyssey” begins with the publication of our Q&A with host Neil deGrasse Tyson. We also have an exclusive insider peek — written by the show’s research coordinator, Brandon Fibbs — on what it was like to work on the new show alongside the famed astrophysicist. Then another article from Fibbs about his thoughts on working with Ann Druyan, executive producer and writer for both the old and new “Cosmos.” Our show coverage wraps up with our own synopses of each episode of “A Spacetime Odyssey.” As well as previewing “Cosmos,” we’ve got an interview with Jackee Mohl, a structural engineer for Boeing’s V-22 Osprey aircraft, to celebrate Women of Aviation Week Worldwide. And we present you a view into one man’s journey to produce “In Saturn’s Rings”, an IMAX movie to be released in museums later this year. While that may seem to be enough fresh content to fill an entire issue for some magazines out there, that was only the tip of the iceberg for us. We also packed the issue with stories about Bigelow Aerospace, the Spitzer Space Telescope, David Hearn, builder of the Kissimmee Park Observatory, and more. As a structural engineer for Boeing, Mohl takes great pride in the V-22 Osprey. Ann Druyan, along with Neil deGrasse Tyson, brings back a cherished televison show. These women are proof that men do not have the world of geekdom to themselves. With working experience on three rovers, Lichtenberg knows her way around Mars. After a decade of amazing results, the Spitzer Space Telescope has a new mission.